Last month I wrote about the Galveston Hurricane of 1900, but there was too much to cover in one post. So this month tells about the loss of lives at the St. Mary’s orphanage. Called St. Mary’s Orphan Asylum, the building sat near 69th Street and what is now Seawall Boulevard. A historical marker is there at the spot. All over the world, on September 8th, the members of the Sisters of Charity of the Incarnate Word sing an old French Hymn, “Queen of the Waves” in memory of those who lost their lives that fateful day. Every year in Galveston, a ceremony is held at the memorial and includes prayer and wreath laying at the marker. Sometimes they will also sing the hymn, "Queen of the Waves." In 1911, the Hotel Galvez was built on the land of the orphanage. Legend and folk-lore tells of the spirits of children in the hotel roaming the halls in places they died on that fateful day. The building for the asylum was located where it was because it was far enough away from town to avoid the threat of yellow fever. 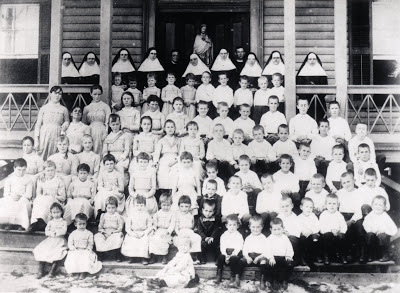 The asylum thrived and grew to have close to 100 children in residence with ten nuns to oversee them. The left picture is of the older orphans and the one on the right one is of the youngest. 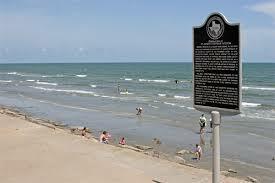 At that time Galveston prospered and was one of the busiest seaports on the Gulf Coast of Texas. The whole area seemed poised for greatness in the history of Texas. No longer the queen she once was, Galveston has gone down in history not for her greatness, but for her tragedy. offered some protection from the waters of the Gulf of Mexico. The balconies along the back of the buildings faced the gulf. 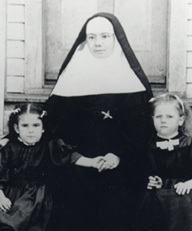 As the waters rose, the Sisters moved the children to the second floor. One of the workers, Henry Esquior, collected clothesline rope to tie the children together if necessary. With wind gusts of 100 miles per hour, the waters of Galveston Bay and the gulf met, completely flooding the city with the tidal surge striking the south shore at 7:30 in the evening. Water filled the first floor. Almost every window was broken out sending the wind and rain roaring through the building. The boys’ dormitory collapsed and was carried away by the flood waters. The Sisters cut the clothesline rope into sections and tied the children together. Each sister tied herself between six to eight children. Eventually the building lifted from its foundation. The bottom fell out and the roof came crashing down to trap those inside. Miraculously, three boys survived and were found in a tree where they floated for more than a day before being rescued. Then they told their story to the Sisters at the hospital. The Sisters were buried wherever they were found, some with children still tied to them. Even in death, they kept their promise not to let go. Despite their loss, the Sisters of Charity of the Incarnate Word continued with their mission of helping orphaned children and opened a new asylum one year later at 40th and Q Streets. This time it was located within the city limits and continued in operation until 1967. Riley Thornton needs a mother for his three children. Annelle Pugh needs to get away from her domineering father. 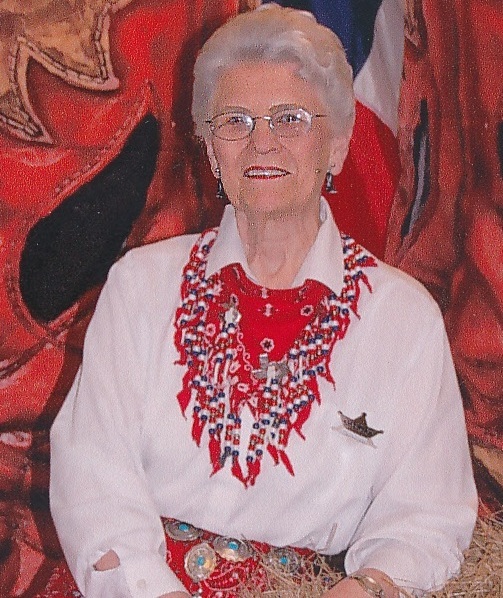 She knows nothing about children, but answers the call for mail-order brides to Wyoming thinking she can learn on the job. Despites cooking and housekeeping disasters, tries hard to win the hearts of the children and Riley. Will Christmas bring the blessing the entire family needs to be complete? That's such a tragic story, Martha. So sad that so many children and good women perished. I remember reading a book set in Galveston during the flood--Janice's, I think. You're right. Janice did write a book about it and that's what got me interested in the story behind her book. I didn't either until I read Janice's book, and I've lived in Houston over 50 years. So many innocent lives lost on that day.